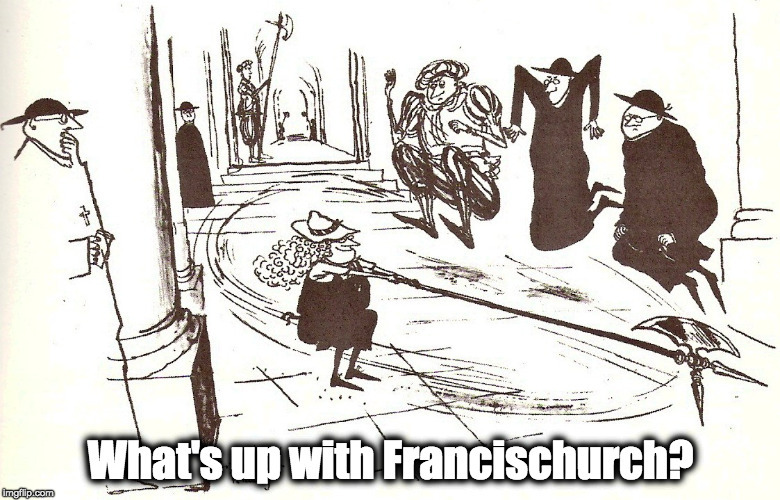 Five step programme to re-write Catholicism – What's Up With Francis-Church? In the City all day, in conversations with various contacts, so not much from me today. Except to report on the rapidly growing consensus that the long game is to impose formally onto the existing structures of the Church an entirely new religion. That was just to tell you that we are not making up what we write. But there’s more. In these days the famous C9 was held, that is, the council of 9 Cardinals of whom we have spoken before. These 9 Cardinals are the “councillors” of Bergoglio. And the press office of the Vatican publishes the contents of these meetings, aside from, however, a topic which seems still to have to stay confidential. Bergoglio has not managed to attend all the meetings of this C9. It seems that he has not attended only twice. In one of the meetings in which he participated, the Argentinean Cardinal seems to have “pressed” not only for the reform of the Curia, but also for the “support” of the Commission which is currently working on intercommunion with the Protestants. Now, from what I’ve been given to believe, it seems that by April these Cardinals must meet together again. And that by then a sort of “pastoral letter” must be ready which would begin to prepare the people of God for a liturgical ecumenism; therefore pertaining to intercommunion with the Lutherans. In the meantime the purges of the Vatican continue. Cardinal Burke has been sent on a mission. Monsignor Negri has been retired in record time. Only the fate of Cardinal Müller is still awaited, which ought to arrive any moment. And it’s as good as done. All the same, it’s strange that just yesterday (at the conclusion of the C9), Burke’s missionary brief was made known. In fact I wouldn’t say it’s that strange! The C9 has spoken about how to reform the Curia and purify the College of Cardinals. It’s called the one world religion and the second beast of Revelation 13 starts that, the False Prophet. Glad to know the Pope and his supporting cardinals and bishops are more Christ-like than Christ Himself. Holier than Christ, more merciful and more charitable than Jesus. It’s the Second Coming, new and improved! And his name is Pope Bergoglio! Meantime worse things are happening – all to solve manufactured crises like a priest shortage. This is Marxist. Well I admit, I was waiting not for the Imposter on the Chair of Peter to answer the dubia, no, not that, but for the faithful CARDINALS to do something that resembled anything regarding the issuance of a formal correction to a wayward heretic pope. I mean, I believe that is somewhere in their job description. But as of about 48 hours ago, out of the blue, I realized this is not coming. Not now. Not ever. Not even if he held a VIII and declared it was now required men be homosexuals before entering seminary. I probably just gave someone an idea. I am now suggesting that Cardinal red be turned into Chicken yellow. He must be the false prophet , then. I don’t see any other way around it. I don’t think the question here is whether they are headed this direction. Did he really say (in its Italian equivalent, of course), “They’ve got another thing coming?” That’s scary and what’s also scary is that everybody just sat there and listened to him. It is like the parody video of Hitler’s last days. Hopefully last days, in the case of the Argentinian Fuehrer, but unlike Hitler, he’s left an apparatus that will take over even if he is carried off by winged monkeys. I think the list of his priorities is right on target, but I think there’s going to be another thing, which will be destroying the link between the Church and Rome. This will be done by abandoning – or ceding to the Muslims – the historical structures that are under his control. I don’t find it difficult to believe that Pope Francis wants to do these things. What I find hard to believe is that he would be so brazen to as to try and accomplish them in the near future. He has been trying for 3 years for to win acceptance for communion for the divorced and remarried. Say what you will about the resistance to his program, it has at least been strong enough that he is reluctant to say plainly what he is trying to do, even though everybody already knows. Even in his exhortation, he has to go through this retarded kabuki theater where he buries what he really wants in some stupid footnote. These things listed above are just as radical, if not more so. He is really going to try to push them through while his first project is still causing so much conflict? I mean I guess I don’t put it past him, but I also don’t see how he tries to do all these things right now without causing a schism of some sort for sure. He’s got to know that, right? I was there that awful night he walked out on the loggia for the first time, and I was pretty sure I knew what we were in store for, more or less. While I haven’t been all that surprised at what’s happened the past four years, I guess I never really thought he wanted to actively provoke a schism. Then again, who am I to judge?